This week is half term in these parts. Of course this makes no real difference in a home-schooling household – the only difference here is that the Stinker is also home for the week, taking the pressure off me slightly. It means I can spend some quality time with all three of my girls separately. But most of all it means I can spend some quality time with… me! As I wrote about in Stop, I want to get off! there are some days when I feel like screaming this and having a break. But then I actually get to spend some time alone and it’s not long before I miss everyone. About a month ago (when we first started home schooling Pickle as well as Poppet) I was desperate for some time off. I actually went through my Facebook friends (it’s a good way to ensure you don’t forget anyone!) to find out how many people I know without children. I was craving some time as the ‘me’ pre-kids. So, when I realised I had less than a handful of child-free friends I was slightly shocked; it was also a wake up call to the fact that I should stop moaning and be grateful for what I have (as most of the child-free friends would rather like some – have mine!). The most obvious is the longing feeling that was always within me – even when I was in my early 20s enjoying singledom, I still desired more. As much as I enjoyed spending time socialising with friends I’ve never been one for small-talk, so I really don’t miss the nights out at noisy pubs trying to shout over the music to be heard by someone you’re really not interested in! Drinking… Last weekend the Stinker and I had a few drinks (he got drunk; I know my limits but definitely drank more than the usual couple of glasses of wine at home). I don’t miss feeling drunk or the costs involved! I love peace and quiet (and certainly crave it at times!) but having it all the time can become quite lonesome. I’ve never been keen on tv (Back to Basics) but I often used to have it on just for background noise – I don’t miss crappy soaps! Worrying about what people think – I’ve always been a bit of a worrier but the more settled I become in my life the less I worry! Stop, I want to get off! Having children was all I ever wanted. I always remember those conversations at school, then college, then university, where people asked about your future ambitions. It always felt like they were expecting an academic or career based answer rather than my response – to have a family. I often felt that this was not a good enough answer, that I should have been striving for more, but I always stuck to my guns knowing that this was everything to me and no career could ever top it. I was right and having my three girls in a loving partnership with the Stinker has been everything, and more than, I ever dreamt it would be. If course that does not mean it has all been easy or plain sailing (as I have written about in Feeling Fragile and Back to Basics). I have to admit there are days when I feel like screaming “Stop, I want to get off!” and wonder what life would be like if we’d chosen less or no children… but I always come back to the simple fact that they complete me. Since homeschooling I’ve obviously been spending even more time with all three girls. This was part of the pull of doing it but I’m sure you can imagine how full-on it can be at times! Some days the Stinker returns home from work and I just give him the look and disappear upstairs for some time out! My Saturday morning ‘me time’ is always much needed, even if it is often spent holed-up in our bedroom, like a student, with my music playing and a book with more words than pictures on each page! 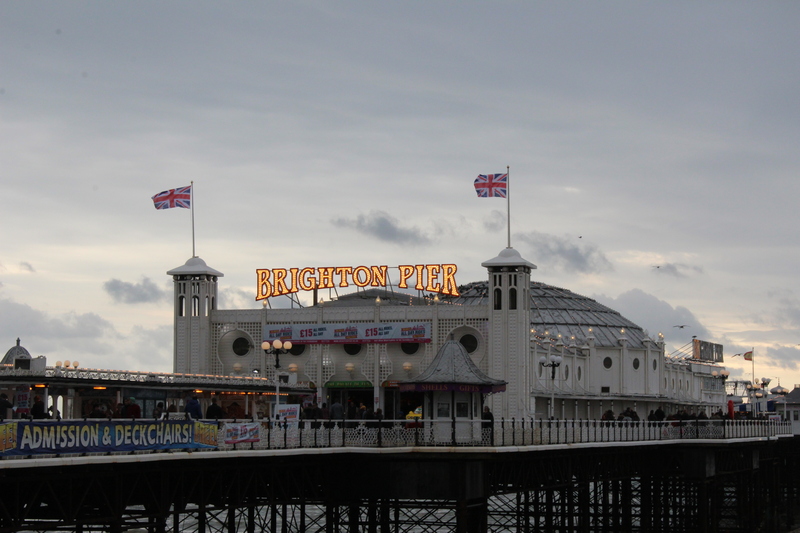 Last weekend the Stinker and I went for a much needed break together to Brighton. We dropped Poppet, Pickle and Piccalilli at nanny and daioo’s house and off we went. Getting stuck on the M25 didn’t even matter because, as I kept reminding the Stinker, of the lack of whinging coming from the back of the car. In fact it was quite a treat to be able to sit ‘shotgun’ for once! Staying up until 3am knowing no small people would crawl into our bed and punch/kick us in the head in three hours. Eating out not just once but for every meal at the times we were hungry. Playing the 2p games at the amusements ourselves, not having to share the money out fairly. Wandering around with nowhere to go and nobody asking where, when, why? Actually being able to enjoy the extra hour in bed when the clocks went back. All this said, I did miss my girls and was excited about seeing them when we returned to collect them.